Phoebe: We’re going to get cookies? Phoebe: I like cookies. I want chocolate chip. I couldn’t help but to crack up a bit. I know exactly how Greg is feeling right now. That little voice inside our heads when we are thinking to ourselves, “Oh crap, how am I going to explain this to her. Is she going to have a meltdown? Where is she getting ‘cookie’ from? I am sure I said ‘Cooking’. Some people tell me I have selective hearing. Actually that’s not true, most people I know tell me I have selective hearing. I think Phoebe has imaginative hearing. I know there is no-such-thing, but in honor of Phoebe, I am coining the phrase right here and now. She is at such a fun age right now. Three, four and five are the funniest little ages where their reasoning skills are not based on anything logical. Nor should it be, they are kids. And they do the most random things. For instance, we sometimes go to coffee hour after church. We typically sit together as a family and share a table with another family. So this particular sunday wasn’t different from any other Sunday. We were all gathered around a table with another family and having a nice conversation and I happened to notice Phoebe was missing. I looked around to see where she was. I assumed she was getting more *cookies* (I had to throw that in, and I am not far off…I am pretty sure that’s what she was eating that day). I looked all around and couldn’t see her anywhere. That little panic feeling went off in my stomach until I noticed little Phoebe sitting contentedly at the table next to us. She was just hanging with a table full of ladies ages 75 and older. They were looking at her and talking with each other and giggling. And there’s Phoebe, just hanging out. Completely oblivious to the strangeness of the situation. I only say it’s strange, because we don’t know any of them. She was swinging her little legs up and down, sipping her lemonade, chomping on her little cookies and letting the crumbs fall out of her mouth onto her dress. Not a care in the world. I almost started to say, “Phoebe, what are you doing? Come sit with your family.” I called Greg’s attention to the situation…we both looked at each other and laughed. Typical. 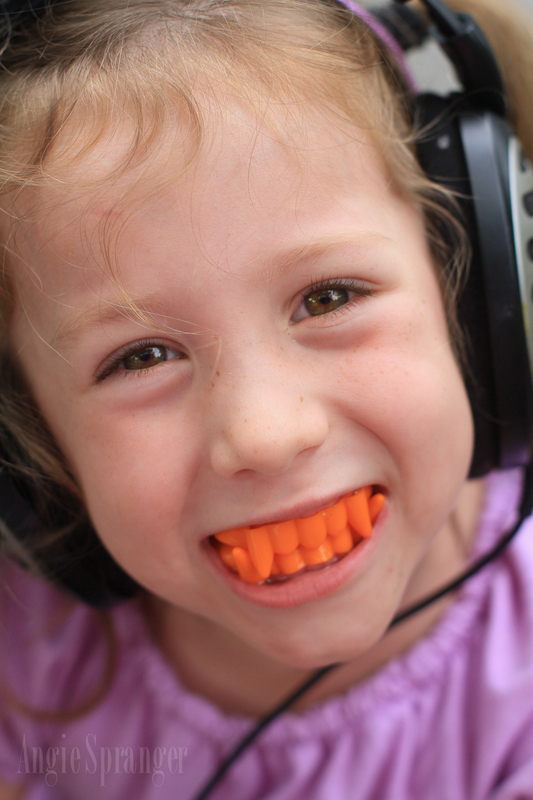 On this Sunday, September 7th, 2014…I declare my beautiful spirited little 4-year-old, has imaginative hearing. I love it! This entry was posted in Daily Adventures and tagged celebrating, Family, feed your soul, happiness, imaginitive hearing, kids, life soundtracks, love by ceciliaandhersisters. Bookmark the permalink.